The death of the great German baritone Dietrich Fischer-Dieskau (on 18 May 2012), only days before his 87th-birthday, has understandably sent shockwaves across the musical world. The first reaction of music-lovers and radio presenters will be to reach for some of his recordings – but which ones? He made more records than any singer before him; and it is a fair bet that no one will match his achievement in the future. As most people will be bewildered by the choice on offer, which will only be increased by the inevitable memorial releases, and as a younger generation has already arisen that did not hear him in his prime, one listener’s perspective on what I call the Dieskaugraphy may be useful. The facts of his life are relatively simple; and as with most musicians the early years are the most interesting. He was born in Berlin on 28 May 1925 and his headmaster father did not add his mother’s name Dieskau to the family name of Fischer until 1934. It was a cultured, music-loving home – elder brother Klaus became a distinguished choral conductor – and Dietrich was brought up to appreciate German poetry. One thing he did not welcome was being forced to join the Hitler Youth. At 16 he began voice-training with Georg Walter. His first performance of Schubert’s Winterreise, given at school in 1943, was interrupted by an Allied air raid. Conscription into the army led to two years as a prisoner of war, hence his superb command of English in later times. Fischer-Dieskau was a most distinguished opera singer, who sang in the premieres of such works as Frank Martin’s The Tempest (1956) and Hans Werner Henze’s Elegy for Young Lovers (1961) although, with his height and basic nobility of posture, he felt unable to sing certain roles in productions, notably Papageno in Die Zauberflöte – fortunately he recorded it. He also had the typical singer’s round face, which made him difficult to disguise, although he had great success as King Lear in Aribert Reimann’s opera, at Munich in 1978. Among his best roles were the Count in Mozart’s Le nozze di Figaro and the title role in Don Giovanni. He was a Bayreuth regular in the lyrical Wagner baritone roles in the mid-1950s. His Covent Garden debut came late, in 1965, as Mandryka in Strauss’s Arabella, another of his best assumptions. How does a fiendish crew of Cornish pirates land up in Derbyshire? For three weeks every summer, Buxton, the charming town on the edge of the Peak District, is the centre of the universe for Gilbert and Sullivan fans. This year’s 18th International Gilbert and Sullivan Festival includes virtually all the Savoy Operas, plus a few extras. The event was the idea of Yorkshireman Ian Smith and his son, also Ian. The pair, from Halifax, were worried that, despite growing popularity abroad, the works of Sir William S. Gilbert and Sir Arthur Sullivan were falling out of favour at home. They picked Buxton because of its beautiful opera house, and because it’s right smack in the middle of England. When it started, there were just ten productions. This year, there are 50. The two shows I’ve seen this summer are both outstanding — and very funny. 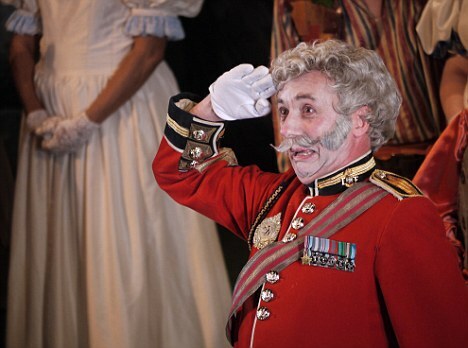 The Pirates Of Penzance, which has a further performance on August 20 and is given by the resident company, boasts a splendidly doddery Major-General in Simon Butteriss and a swashbuckling Pirate King in James Cleverton. As winner of the 2010 Lionel Tertis International Viola Competition on the Isle of Man, Milena Pajaro-van de Stadt was entitled to a Wigmore Hall recital – and full marks to her for playing a largely unhackneyed programme. (Those of us who love the viola groan inwardly when we see yet another selection of the same handful of works advertised. No wonder the quite unjustified assumption is sometimes made that the instrument has no repertoire.) Pajaro-van de Stadt featured just one Certified Viola Classic, Schumann’s Märchenbilder (Fairy Tales), which she delivered with warm, even tone, supple rhythm, easeful bowing and considerable feeling, enhanced by finely judged portamento. The final movement, with Sophia Rahman providing a firm but sensitively romantic backdrop, was as moving as it should be. Roger Steptoe’s Sonatine I for solo viola was the set-piece for the competition and Pajaro-van de Stadt is credited with giving the premiere. An excellent piece which uses the whole compass of the instrument, it has already achieved an independent life, with performances in France, the US and elsewhere. This performance, billed as the UK premiere (presumably the IOM counts as foreign), was superb and clearly delighted the composer. I was not sure about the wisdom of following it directly with the other unaccompanied work of the evening, Penderecki’s Cadenza, but Pajaro-van de Stadt played it so well that any criticism was silenced.